In 1762 at the age of 6 the Mozart family travelled across Europe to demonstrate the skills of Mozart. 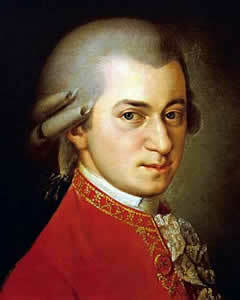 In 1773 at the age of 17 Mozart was employed by the Prince-Archbishop of Salzburg where he composed in many genres. As Salzburg did not offer opera opportunities Mozart moved to Vienna in 1781, first as employee, but soon as freelancer. Die Entführung aus dem Serail, a singspiel, was the first widely acclaimed opera masterpiece. Between 1786 and 1790 Mozart's made his famous series of opera buffas (The Marriage of Figaro, Don Giovanni and Così fan tutte) together with the librettist Lorenzo da Ponte. Toward the end of the decade, Mozart's career declined due to the Austro-Turkish War (1787-1791), depression and illness. In 1791, the last year of his life he produced one of the greatest operas ever written: The Magic Flute. He died at the age of 35.